With the holidays fast approaching it's time for some major giveaways here at Kerrific. 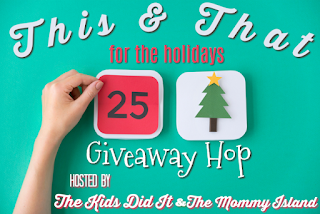 Today we are excited to be participating in the This & That giveaway hop. We're have a set of 5, holiday themed, children's DVDs to giveaway thanks to nCircle! Entering is simple, just use the form below. And when you're done, make sure you hop along to the other participating bloggers to see what great prizes they are offering! Happy hopping! My favorite holiday tradition is buying a real Christmas tree on Black Friday. "What is your favorite holiday tradition?" Eating festive food! For the holidays we like to get our full family together for good food and visiting. My favorite holiday tradition is going to midnight mass on Christmas Eve and opening up presents on Christmas morning. Going to the Christmas Eve service at my church. I love to decorate our Christmas tree! My favorite holiday tradition is hosting an open house for anyone who wants to stop by for a bite to eat including strangers. We have Christmas morning breakfast with family And open presents! Opening one gift on Christmas Eve. I like getting together with my sister and baking all of our Christmas treats together. Our family Christmas cookie party is my favorite holiday tradition. My favorite is watching our daughter sing in the children's choir at Christmas Eve mass! We like to make a cake together as a family and decorate it together as a family. It is Christmas Themed. We then put candles on it and sing Happy Birthday to Jesus. Then we blow the candles out together as a family and say "We are not blowing out the light of this world but taking him into our hearts." My favorite holiday tradition is baking snickerdoodle cookies. I take my grandmother out to eat and to see Christmas lights every year. I love when our whole family gets together on Christmas eve, and plays the white elephant game! It is always such a blast with the most insane gifts! My favorite holiday tradition is watching holiday movies as a family. I love decorating the Christmas tree. We host a gathering for family and friends on Christmas Eve. The Ancient Enemy Series Tour and Giveaway! The Wayfarer Resolve Tour and Giveaway! Cleopatra VII Tour and Giveaway! The Yeast of Eden Tour and Giveaway! The Paranormal Protection Unit Tour and Giveaway! The Kal Medi Series Tour and Giveaway! The Viscount's Promise Tour and Giveaway! The Evening Bower Tour and Giveaway! The Saving Grace Tour and Giveaway! The Fallen Angel Series Tour and Giveaway! The Secrets in Oak Creek Tour and Giveaway! The Black Trillium Tour and Giveaway! The Broken Bows MC Tour and Giveaway! The Shadow City Tour and Giveaway! The Dark Karma Tour and Giveaway! Kerr Enterprises Inc. Powered by Blogger.